Spring has only just arrived here in Wellington, but seeing so many mentions of summer peaches out of the US made me crave one of my favourite fruits. 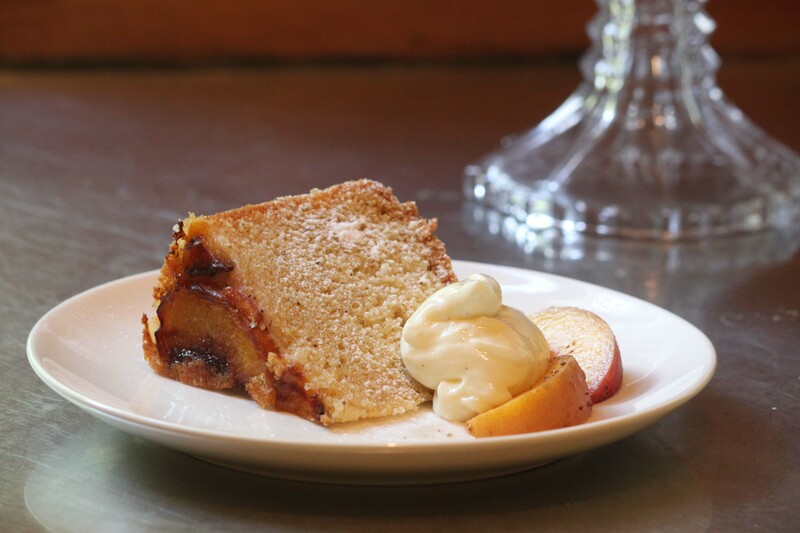 So as a light and sweet introduction to warmer months I tried out this cake with imported peaches and it was lovely – I can’t wait to reprise it later with delicious local fruit, and am already dreaming of other variations! First you need to roast some peaches. 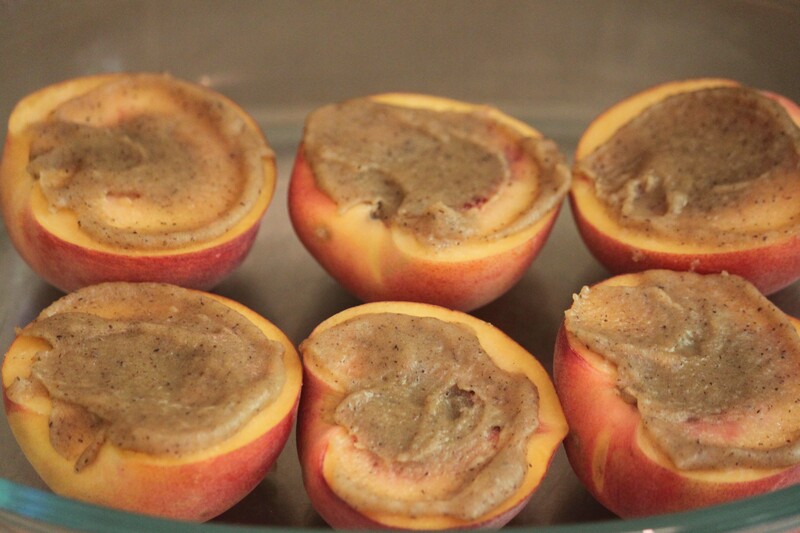 Mix melted butter, brown sugar and vanilla seeds into a paste and spread onto the cut side of halved peaches. Bake until gooey on top and starting to soften. Sift the flour and baking powder together and set aside. Whisk the oil and milk together with a fork and leave it to hang out next to the flour. Whisk the eggs, sugar, lemon zest and vanilla seeds together using an electric mixer or stand mixer until thick and pale. Fold in half the flour followed by half the liquid, then the remaining flour and liquid. Pour the batter over the peaches in the tin and pop into the oven. 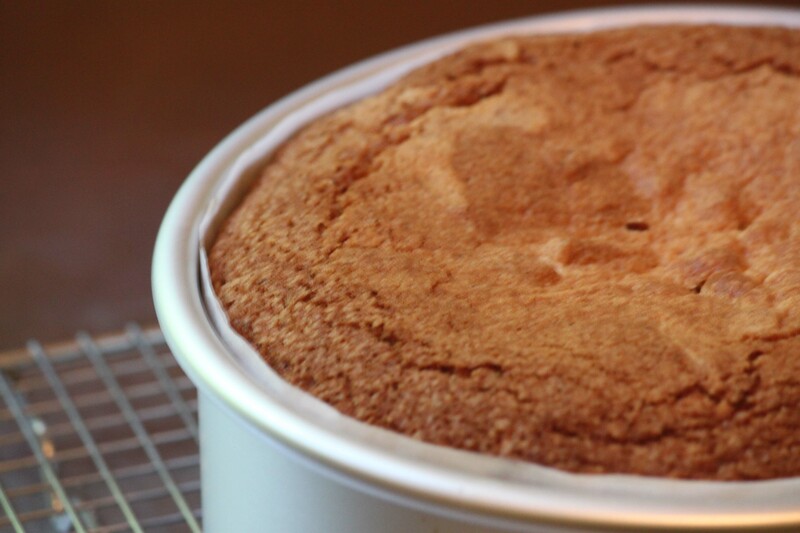 In a 7 inch tin it took about 50 minutes to bake through, if you are using a larger tin which will give you a shallower cake you will need to reduce the cooking time. I suggest checking regularly from about 30 minutes for done-ness. Let the cake cool for about 15 minutes in the tin then carefully turn out onto a rack covered in baking paper or straight onto a serving plate. Serve with extra sliced peaches and a spoonful of whipped cream or dreamy vanilla custard. 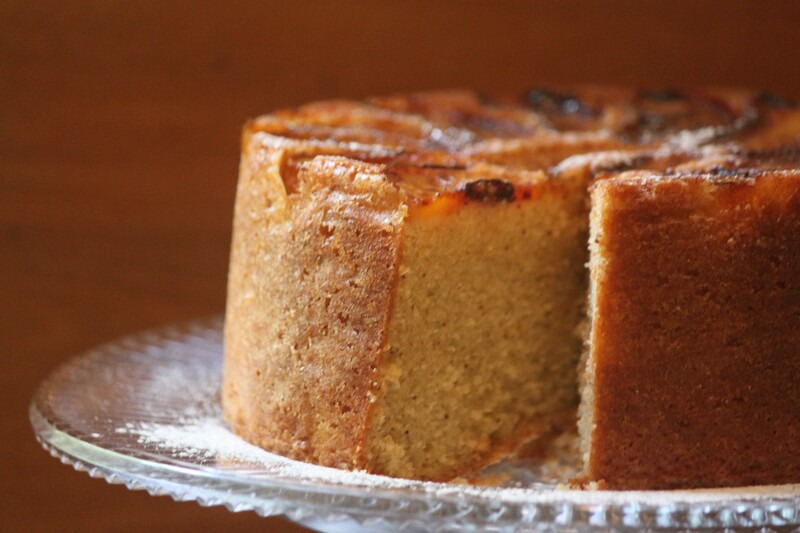 What’s your favourite fruit to hide in an upside down cake? At the moment I am definitely feeling a summer berry variation or a tropical dairy free version with mangoes underneath and the milk swapped out for coconut milk. Preheat the oven to 180C (350F). 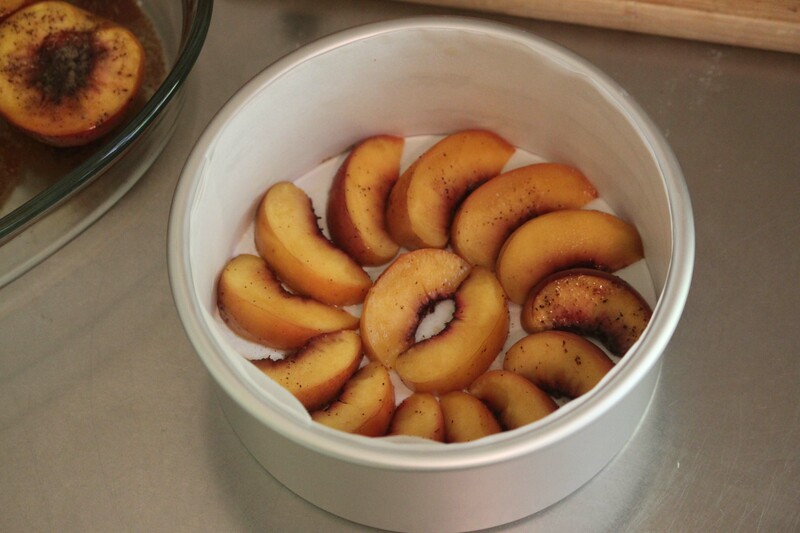 Cut the peaches in half and arrange in an ovenproof dish with the cut sides up. Melt the butter and mix to a paste with the brown sugar and vanilla (split the bean and scrape the seeds out with a knife). Spread generously on the cut sides of the peaches. Feel free to scale this part up if you want more peaches under your cake or just feel like some delicious roasted peaches to eat. Bake the peaches for about 20 minutes until the tops are gooey and the fruit is starting to soften. Set aside to cool. Line the cake tin with baking paper. When the peaches have cooled a bit, slice them thickly and arrange in the bottom of the tin (I used 2 peaches for a 7 inch tin). Sift the flour and baking powder together into a bowl. Mix the oil and milk together with a fork in a cup or bowl. Beat the eggs, sugar, vanilla and lemon zest until pale and thick. Fold in half the dry ingredients then half the liquids then the remaining of each until well combined. Pour the batter into the pan over the peaches and smooth the top. Bake for 45-50 minutes in a 7 inch tin, checking after about 40 minutes for done-ness. For an 8 inch tin I suggest checking from 30 minutes. Cool the cake in the tin for about 15 minutes then turn out onto a rack lined with baking paper or directly onto a serving plate to cool further. Looks delicious – I’m going to try this! I think apricots would be an excellent option. They’re the only fruit I know that consistently tastes better cooked than fresh. Suggest that mango version should also consider including some actual coconut for actual texture. I know what you mean – I love apricots and its so disappointing when you bite in and they’re bland!